This day started in Cleveland (new home) and went south to Columbus, east through Indy, and on to central Illinois all on the interstates. 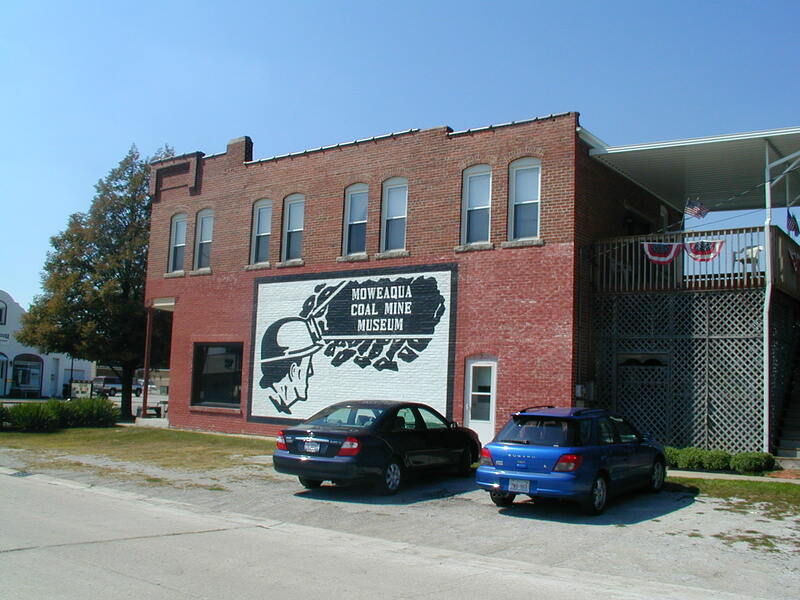 I then stopped in Moweaqua (pronounced Mo-wee-qua) to see the coal mine museum, which is off of US 51 south of Decatur. 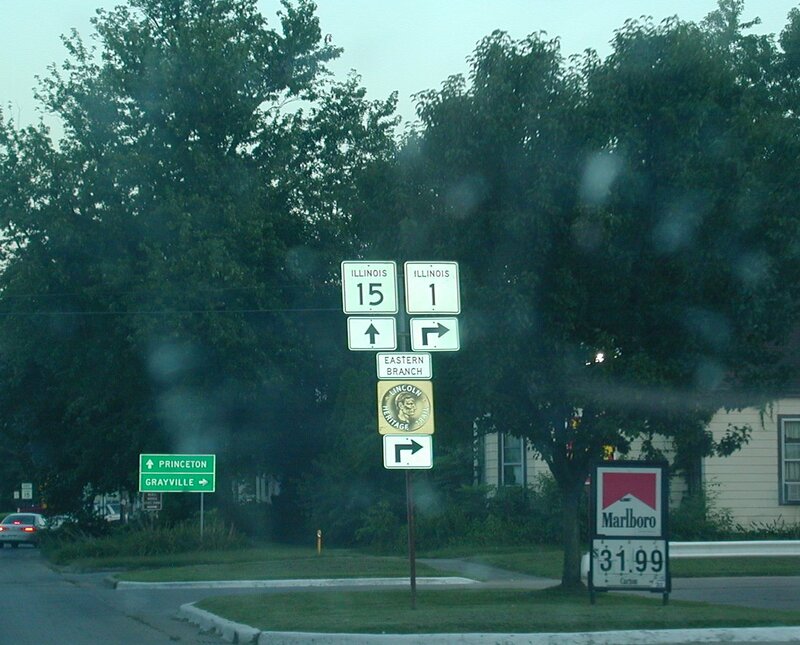 After that, I headed down to Vandalia, then to Marion, via a roundabout way that I can't recall by memory, but is followable by the pictures, to the Motel 6 that I stayed in for a few days. Day two takes us north of St. Louis to the Illinois and Mississippi rivers area, then back down again. 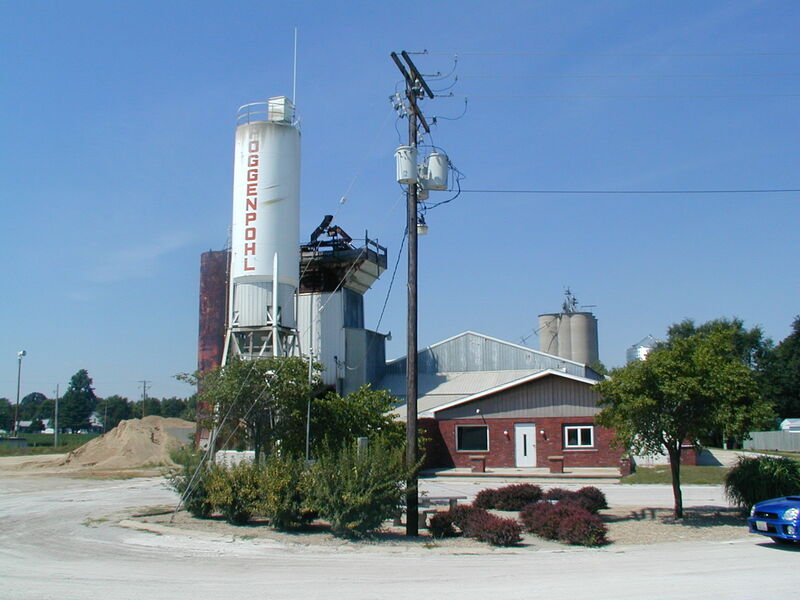 The first real stop of the trip was in Moweaqua. 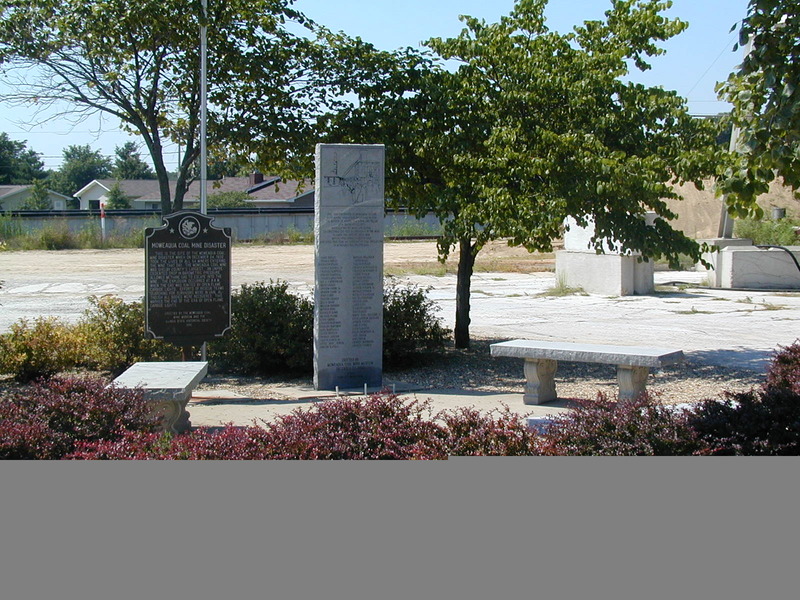 This is on the west side of town at the coal mine memorial, which honors those who died in the Christmas Eve 1932 disaster at this site when the mine collapsed and 54 people died. The actual memorial is where the bushes are in the center of the photo. Sorry about the picture, I don't know what happened. Either way, this is a close-up of the actual memorial. The part that is all screwy is just bushes anyway. As far as I can guess, this is just about where the mine was. They don't tell you exactly where it was, and it closed in 1935, so it's pretty much impossible to tell. 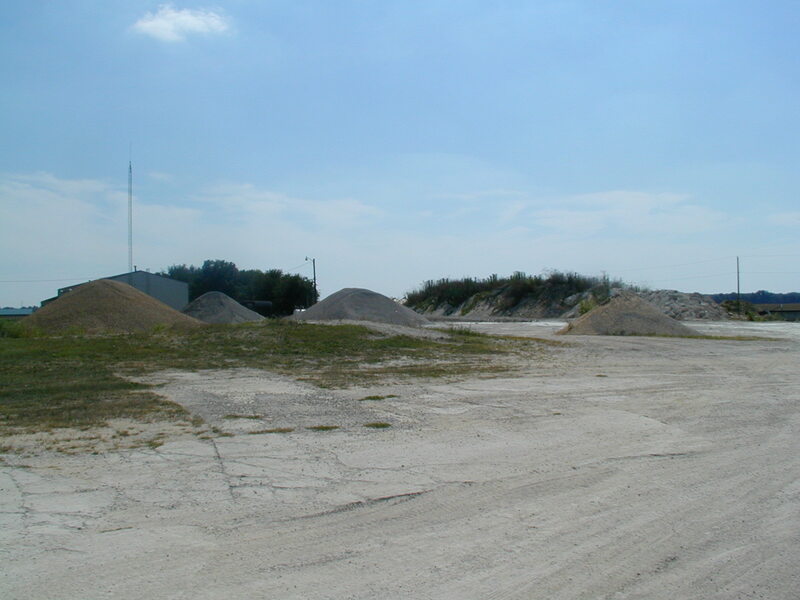 Now it's a gravel pit for the Poggenpohl Redi-Mix company that is located at the site. A very pretty car sits outside the coal mine museum in Moweaqua. A volunteer named Bruce was there and quick to tell me everything I needed to know about the history of Moweaqua's coal mine. The museum was kind of corny, but at the same time very interesting, when listening to Bruce. 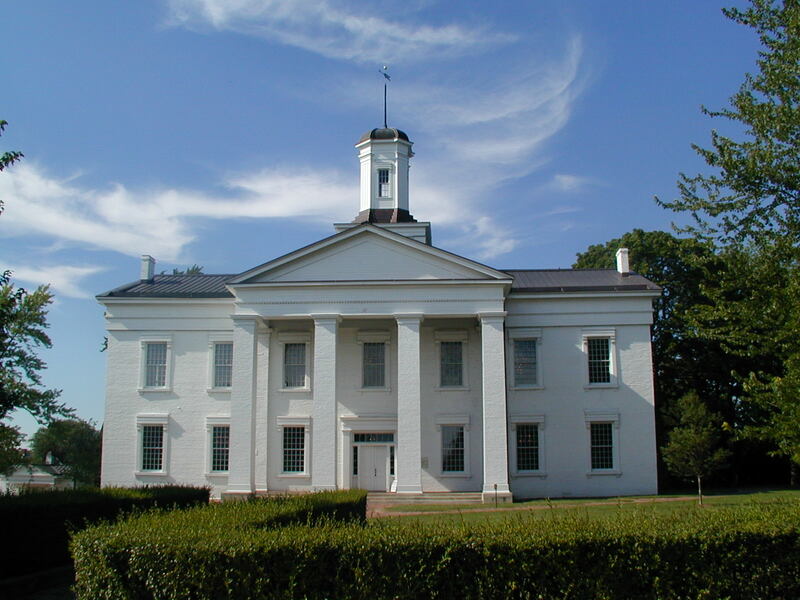 This is the capitol building of Illinois' second capital Vandalia. The place was okay, I guess, as it did have original wood floors on the second level. Seems that the only important thing that happened here was that Abe Lincoln successfully argued to get the capital changed to Springfield. Now on over to Olney, where IL 130 and IL 250 hook up. There wasn't too much to see in Olney. 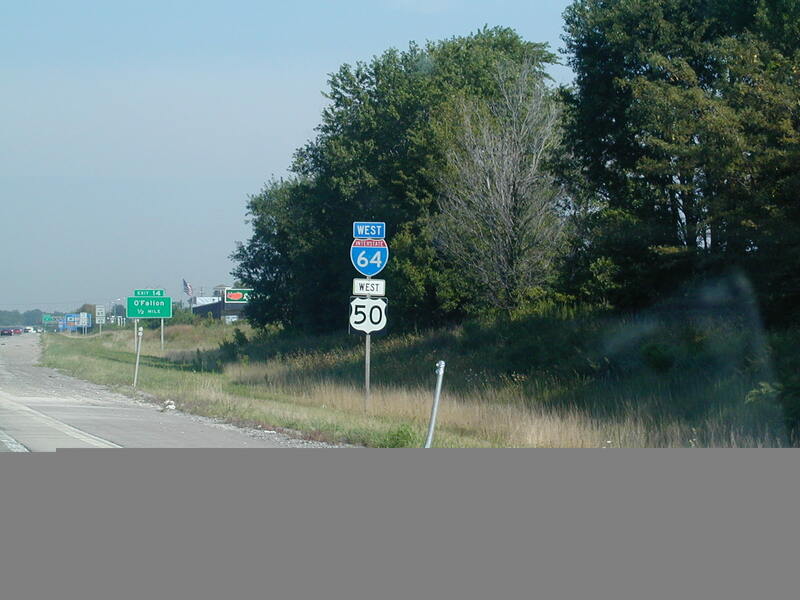 Yes, US 50 and IL 250 are signed together on this recently resurfaced highway. 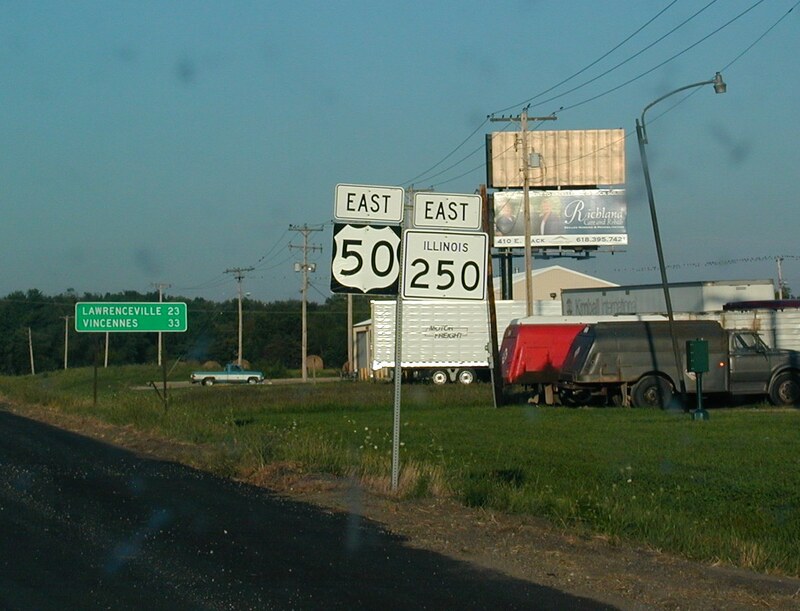 IL 250 is the designation given to the old alignment of the federal highway from west of Olney to east of Lawrenceville. 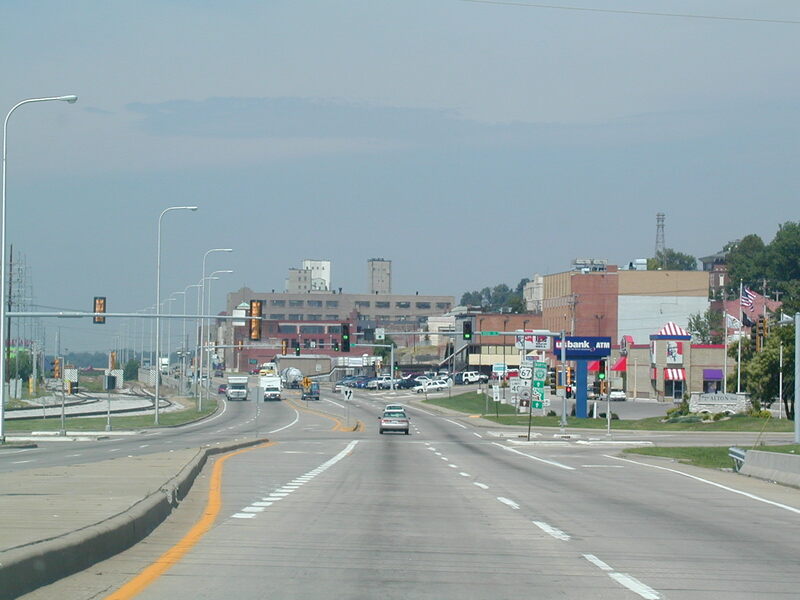 IL 1 and IL 15 come together in this larger city of Mt. 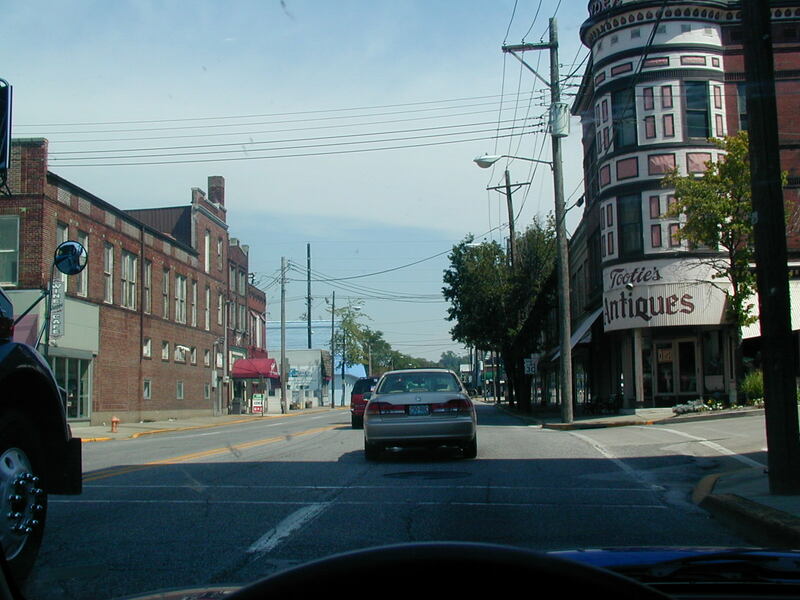 Carmel, located on the Wabash River. 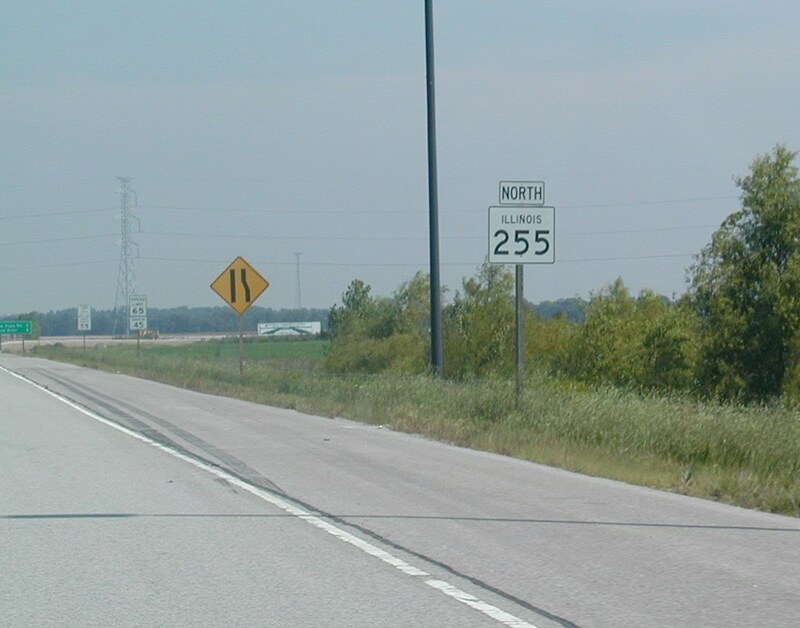 Skip ahead a few hours, and here we are near the current northern end of the St. Louis Beltway, which is known in these parts as IL 255. 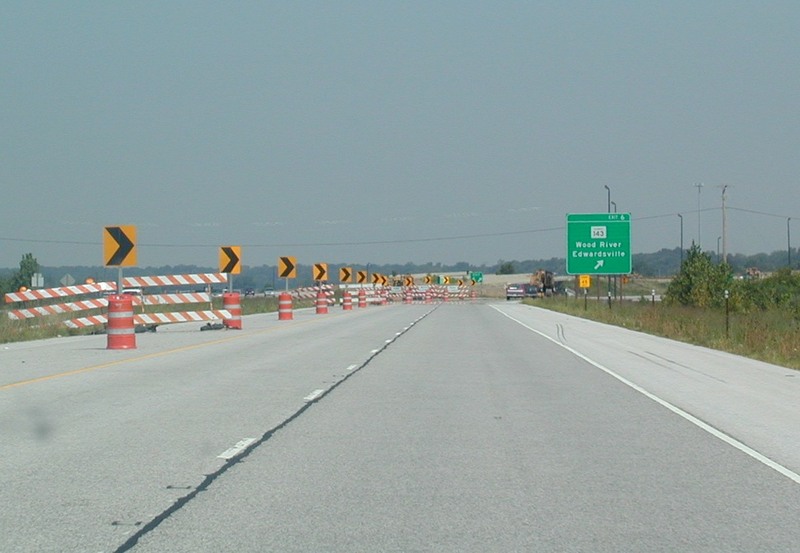 Construction continues northward to IL 140, as you will see in subsequent photographs. Now this is the actual current end of the line, at IL 143. End IL 255 shield. 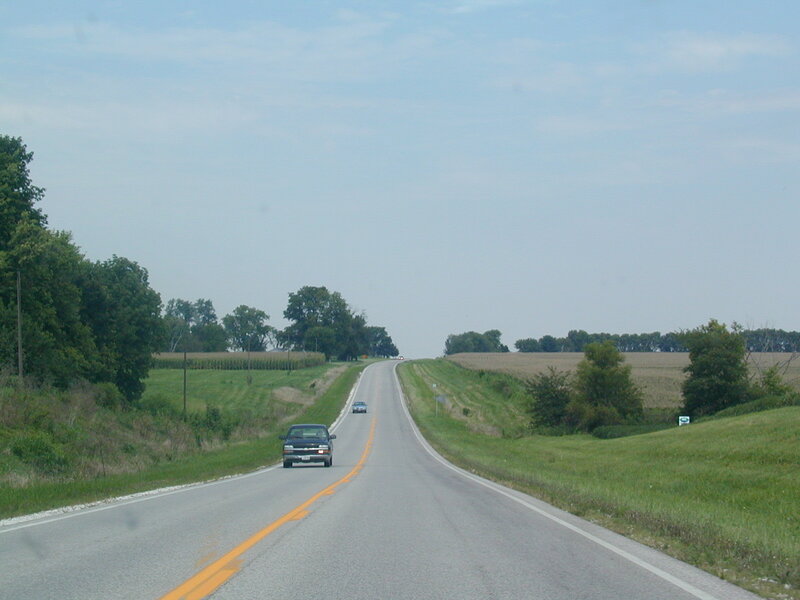 The new highway will be interstate standard and connect with the project to upgrade US 67 from Alton to Monmouth in Western Illinois. 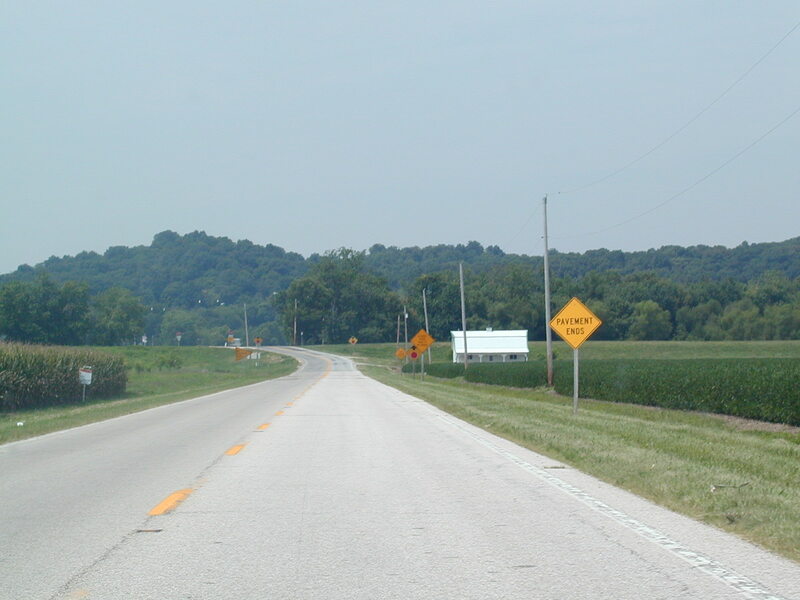 This is IL 143 WB at IL 111 in Wood River. 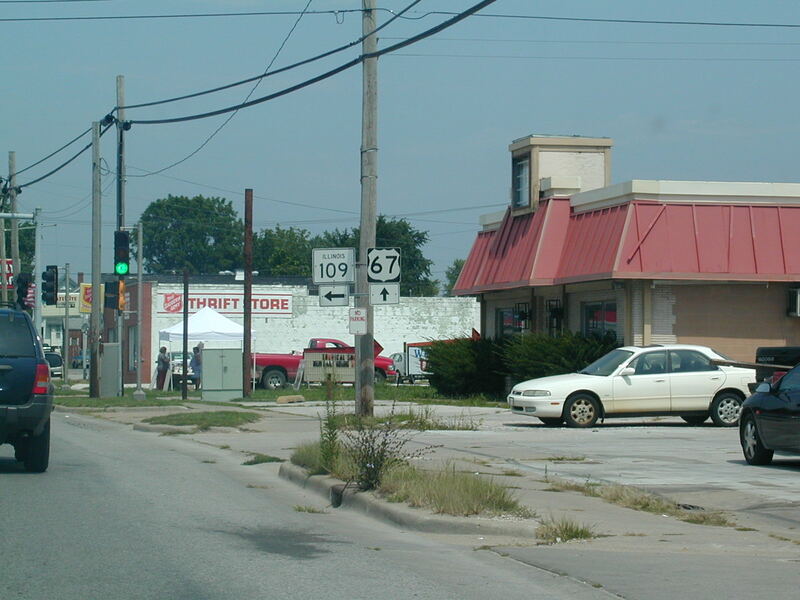 Nothing much special here, except a lot of Wal-Marty type stores and fast food. 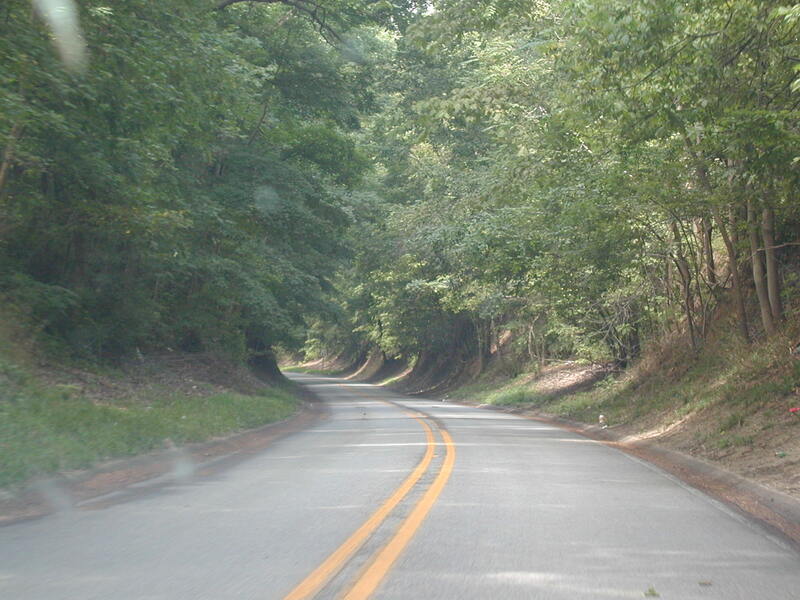 You get an idea of what the road may look like once construction is finished in this area. 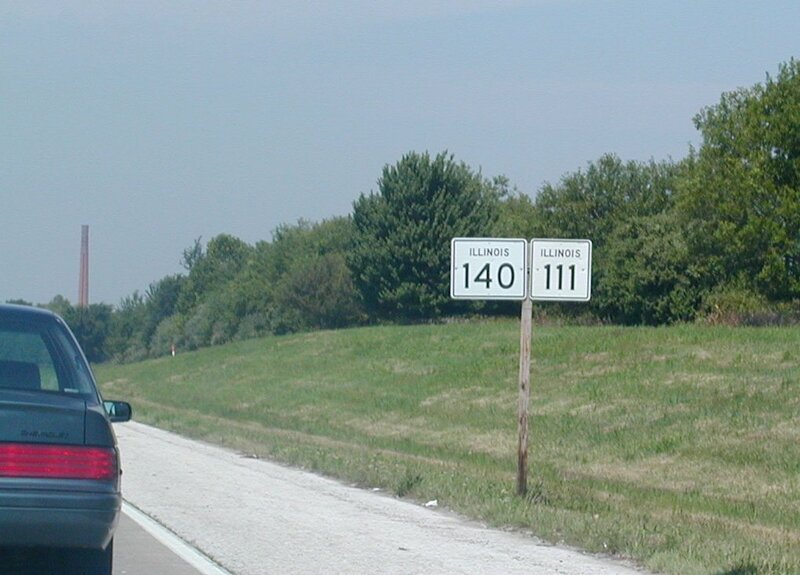 This is on IL 111 NB at IL 140 in Bethalto. The whole town seemed overcome with the construction. 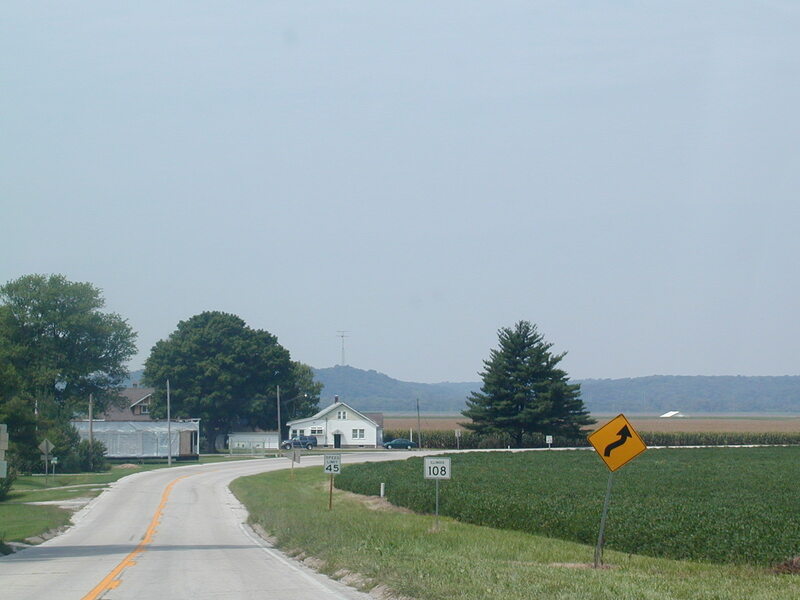 IL 140 and IL 111 headed westward. And we come across IL 3. 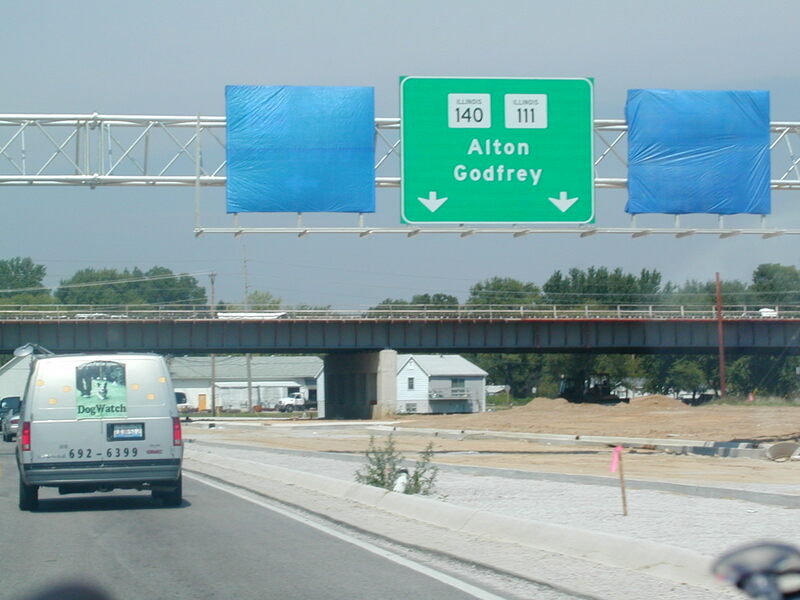 This is from IL 140 WB in the town of Alton. 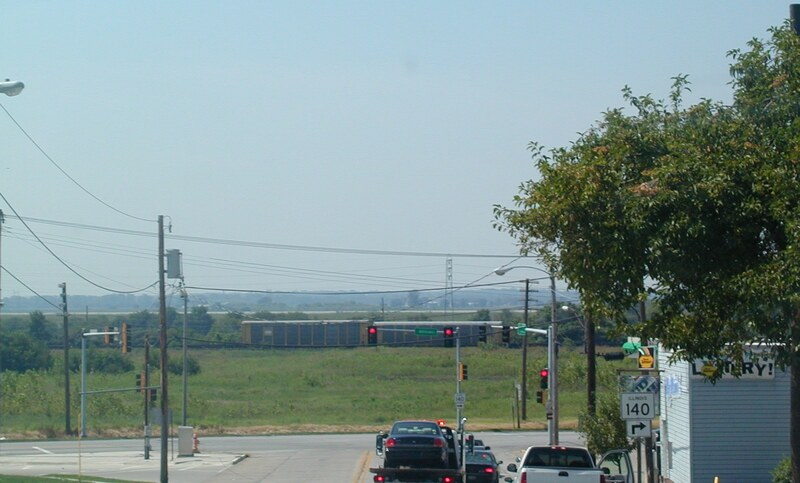 IL 140 comes into town on a hill, then goes through the residential area, and after that, descends down a large hill. From the top of that hill, you get a great view of the Mississippi River, but I couldn't get situated enough, and this is what I could get. 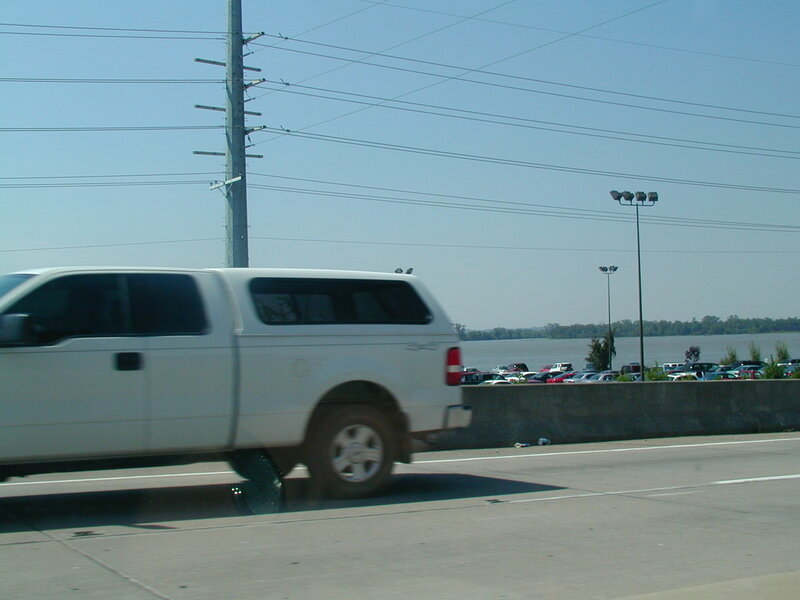 It's not too bad-- that silver strip behind the train is the Mississippi. 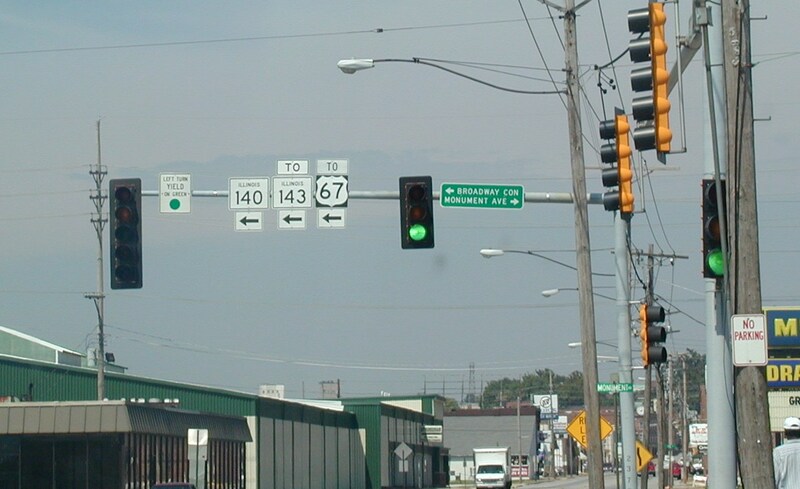 Illinois highway shields on a stoplight mast in Alton. 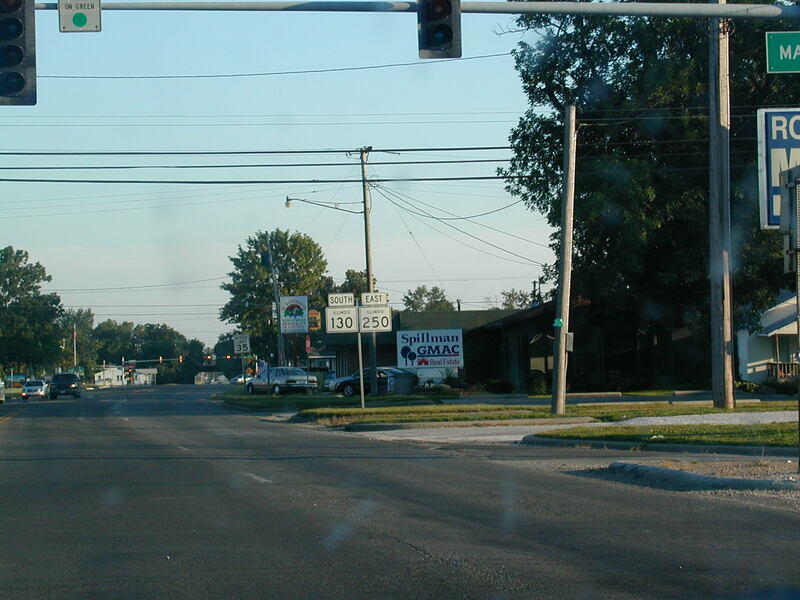 This is the main commercial part of Alton from US 67 northbound. 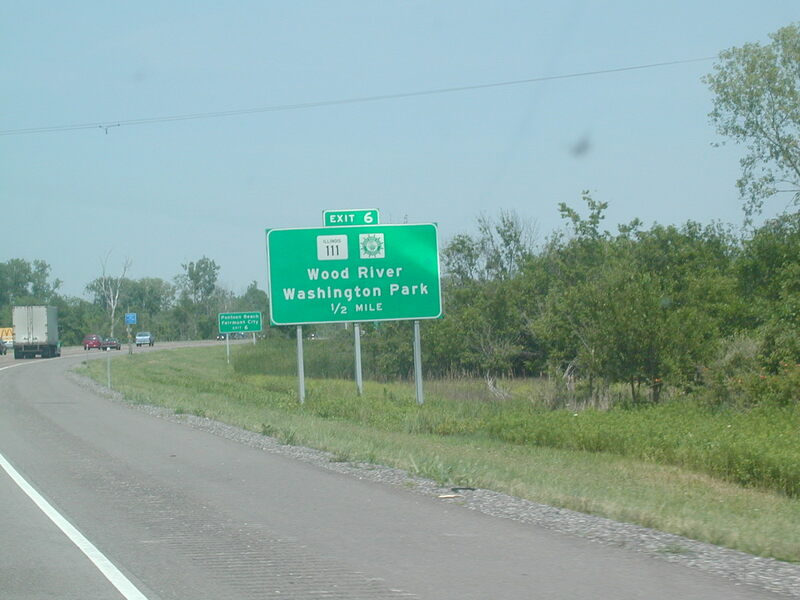 The river is to the left and the River Road continues to IL 100 and then follows that as US 67 splits to the north in a few miles. Imagine the truck is invisible. I promise that this is the last shot of Alton. From US 67 North I think. 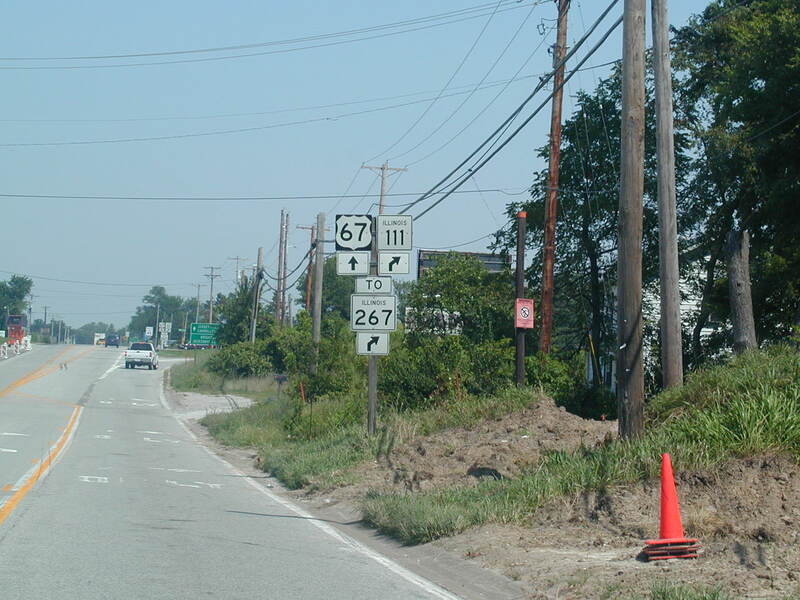 This is US 67 North where IL 111 splits off to meet IL 267. 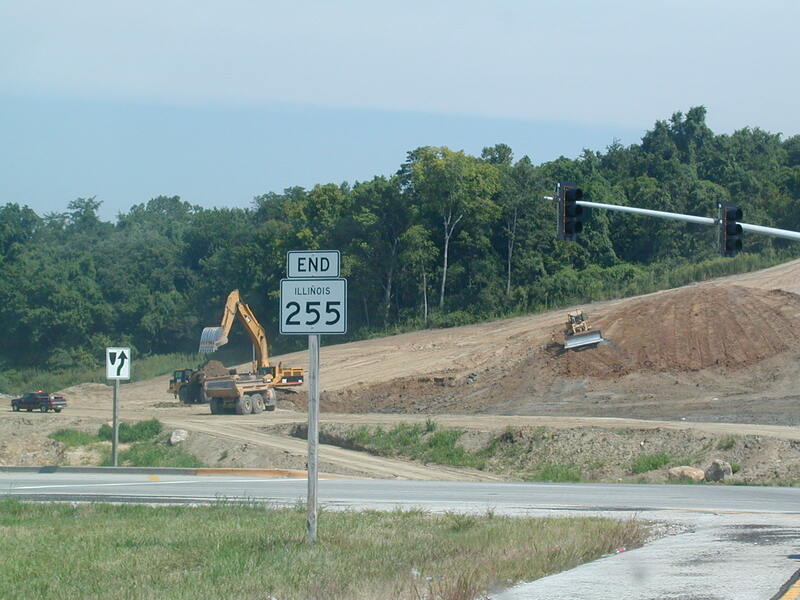 You can see the pre-construction going on in this area for the Alton Bypass. 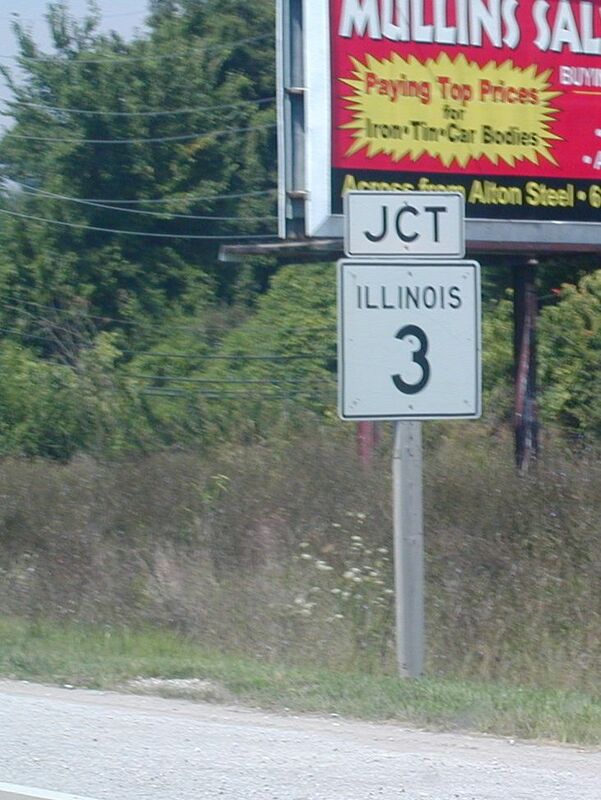 One of my goals in life is to get a picture of every IL highway sign. 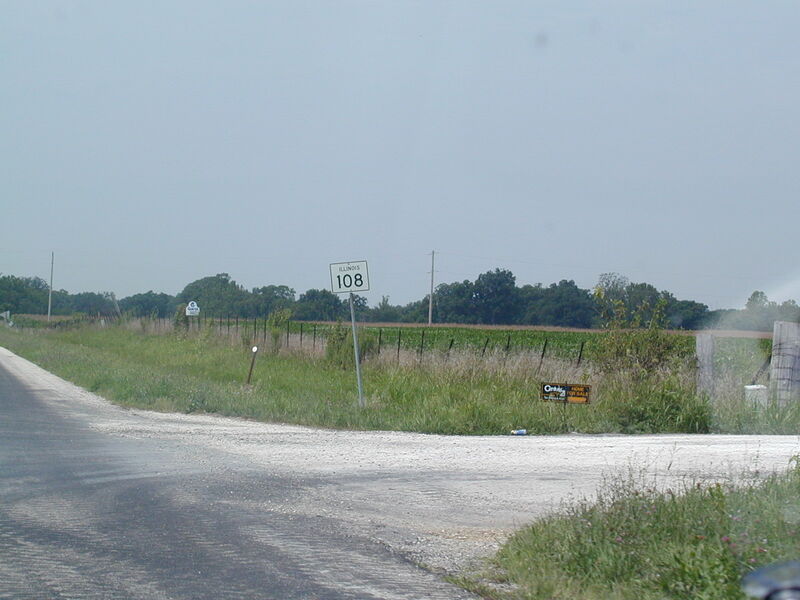 So here is IL 109 in Jerseyville. 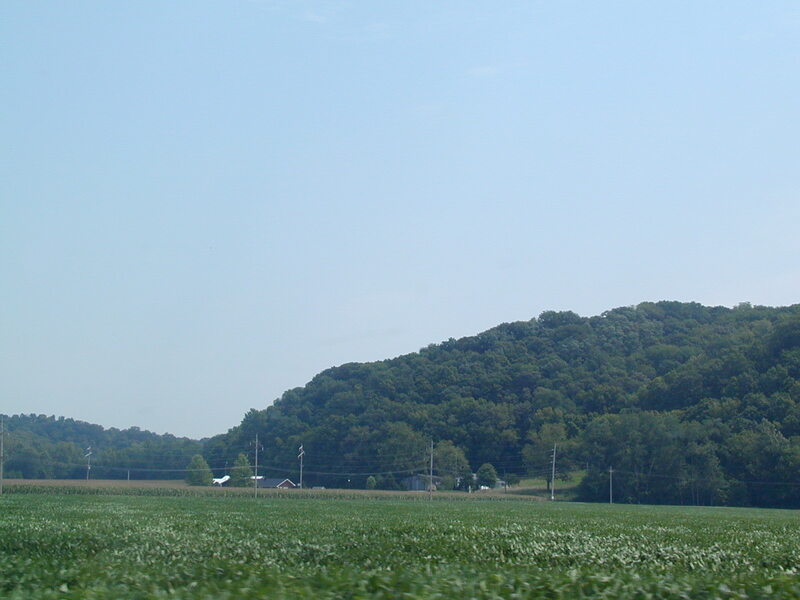 The gently rolling farmland of US 67 North. 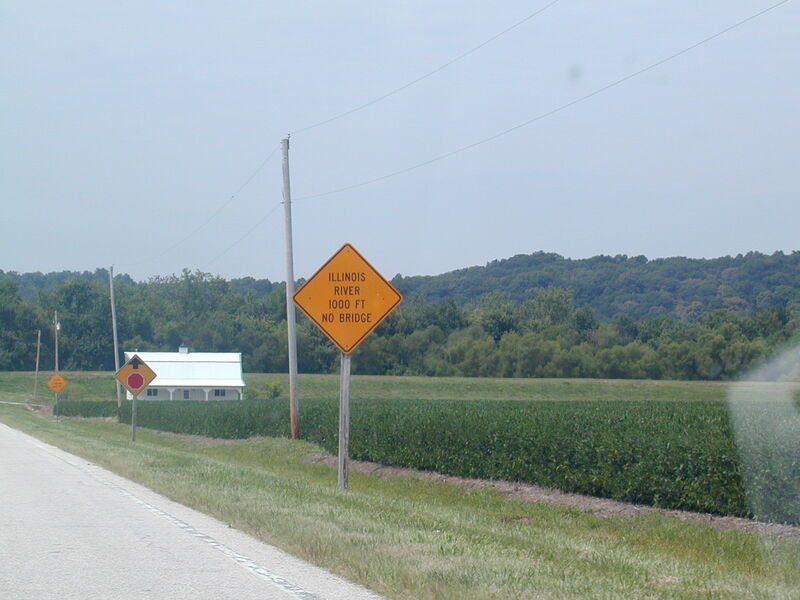 But it flattens out as we get to IL 108 WB. 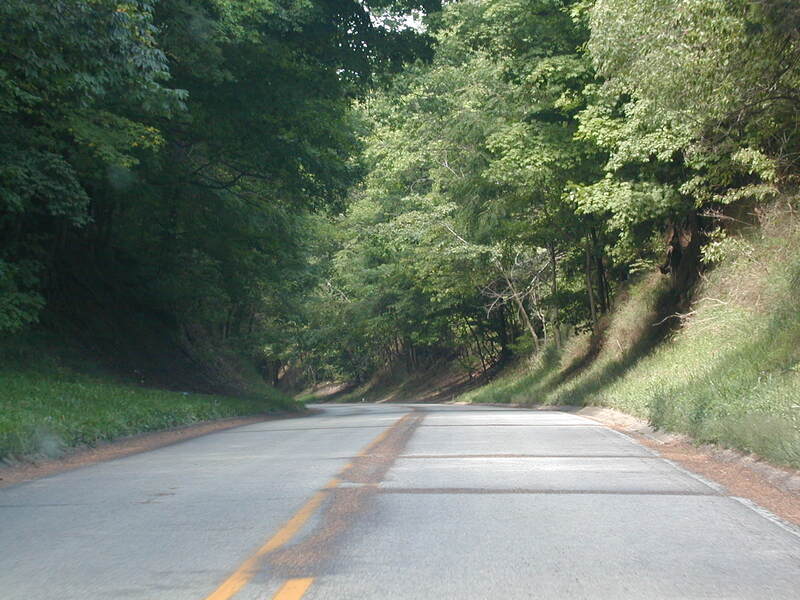 At the base of the bluff, we enter the Illinois River Valley. Sure is flat here. That's the bluff we just came down. Pavement ends?! We're closing in on the river. The ferry is just ahead, ready to take us to Kampsville.